Metcut Research Inc. Cincinnati Testing Laboratories Metcut Recherches S.A.S. Torsional testing is typically conducted on metallic and composite/metallic drive shaft components, shear segment drive components, bio-mechanical constructs and turbine shaft materials. 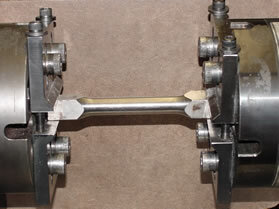 Torsional fatigue and torsional shear testing is conducted with a variety of test machines in the laboratory. Fully reversed torque through 20K lbf/inand unidirectional torque through 1,000K lbf/in testing can be conducted typically to 3 Hz. In addition, our test temperature range is from –65 °F through 1200 °F in a laboratory air environment. Our strain gage capabilities can also be utilized to provide strain analysis during sample or component torque testing. Our capabilities have recently been expanded with a 50Kip axial / 20K lbf/in axial Torsion fatigue machine. This MTS fatigue machine is capable of varying phase cyclic fatigue testing, conducted in axial load/torque or axial strain/shear control. Metcut Research Inc. is the world's premier independent materials engineering and testing organization offering expertise and laboratory facilities in the broad field of materials evaluation - including both metallic and nonmetallic structural materials.